Mount Bromo tour always offers phenomenal beauty, especially in the heart of hikers. In normal days, visitors can enjoy the fuming crater from the peak. It is the volcano that holds a wonderful history behind its name. It is the place where Tenggerese conducts the annual ceremony to memorize the sacrifice of their ancestors. The Kasada ceremony never fails to entertain both local and international visitors. The beauty of its scenery is always enchanting during rainy or dry seasons. However, Mount Bromo tour recently offers quite different phenomena. We all know that Bromo has its unique features of the sea of sands, caldera, and green hills around the volcano. The common 10 km sea of sand in Mt. Bromo has been so breathtaking ever since. Yet, snow covers upon the sea of sand and left visitors in amazement. That snowy caldera is covered with snow because of the dropping temperature around the volcano. It is impossible to snow in Indonesia. But the temperature in Mt. Bromo can drop from 4 degrees to 2 degrees. Therefore, sometimes when Indonesia reaches dry season, the temperature can be that low and cause some snow in the caldera or sea of sand area. The snow will melt after 6.00 am when the temperature is increasing a little after the sun rises higher. Therefore, the extreme weather is like to happen in Malang and Bromo volcano. Tourists should be extra prepared to anticipate the low temperature that will be biting around the volcano. For some reasons, tourists have to perform with excellent body fitness. Though the hiking track is not so extreme, it is still important to keep fit for the low temperature can possibly be a stumble. Now that you are ready to leave for this amazing journey, you need to know the budget for Mount Bromo tour. Mount Bromo tour package price is started from the lowest budget travelers’ could imagine. Tourists will be picked up from the airport from Surabaya or any other desired places. 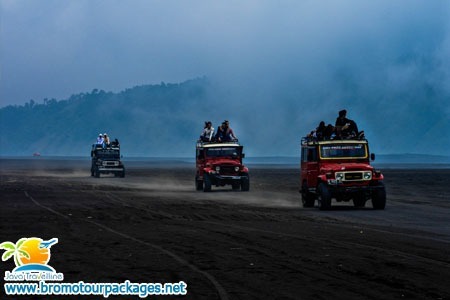 For a whole Malang Bromo Ijen tour package, the rate is a little higher but the memories will last. Tourists will visit some amazing tour spots in Malang. There are several destinations offered for Malang tour before leaving for the majestic mountain. In Malang, tourists can visit apple garden in which they will feel amazed at the old apple garden with the apple variety which is grown nowhere else in Indonesia. The visitors can pick the apples from the trees and that experience will be unforgettable. Besides, Malang also has many natural wonders. But the main journey is in Bromo volcano. The tour can be started from Malang on a shorter track. Visitors will love to climb up the View Points just to get pleasure in the sunrise in Bromo. There are several View Points through some hills around the volcano. The first View Point is Pananjakan 1. Besides, tourists can go to Sruni Point, Bukit Cinta, Bukit Kingkong, and the latest View Point of B29 Summit. No matter where they go to get the best view, Bromo will still look majestic and charming at the same time. It is also comfortable to go for Bromo Ijen crater tour at the same package from Surabaya. International tourists will be picked up from Surabaya. Normally, the package will take 4 days and 3 nights. So, it will be a quite long trip to reach two volcanoes in East Java. When the tour is started from Surabaya, tourists will visit Ijen volcano before Bromo. Ijen is something extraordinary as a tourist destination. It has a deep impression of the volcano with international recognition. In the 1970s, Ijen Mountain was captured into a dramatic picture and featured in France Magazine. That makes Ijen so popular among France travelers. Many international tourists from Europe come visiting Ijen to see how the majestic volcano and the sulfur chunk miners give them the luxurious experience. Get your special package of Ijen and Bromo tour right now. It is a high season and the two majestic volcanoes are ready to make all tourists astonished. Experience the journey right now.